Ubisoft are a company who are well known for their big franchise titles, such as Assassin's Creed, Splintercell, Rainbow Six and Rayman; just to name a few. Once in a while the company adventures above and beyond the thresholds of these captivating experiences to bring gamers an experience that extends outside of their regularly scheduled annual and semi-annual releases. 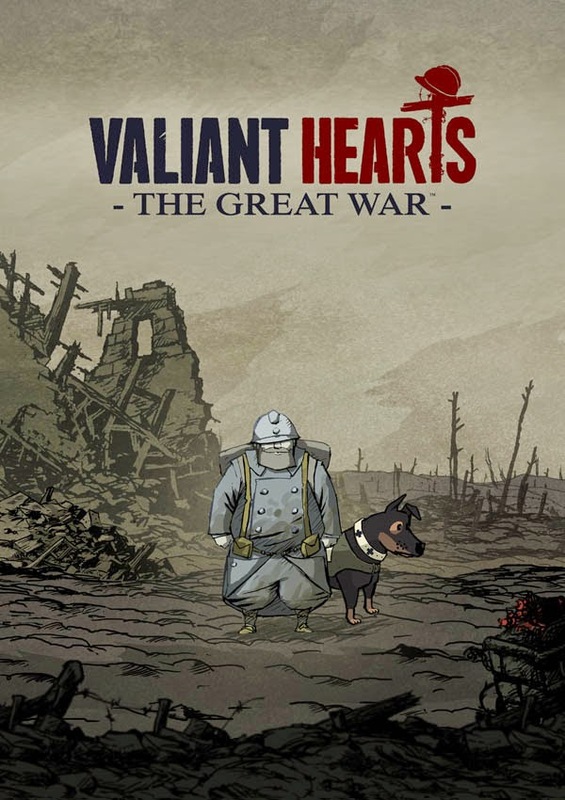 Valiant Hearts - The Great War just so happens to be one of those titles, which was originally announced at E3 2014. The game's unique, cartoonish art and historical war theme quickly won the attention of those paying attention, and it released soon after the event. Valiant Hearts - The Great War begins at the peak of World War I, in 1914; Germany has just declared war on Russia and France is deporting their German citizens. This leads to the forced separation of the German playable character, Karl, and his wife and son, Marie and Victor. Soon thereafter, Karl is drafted into the German army while Marie's father, Emile, is drafted into the French army. Throughout the game the player will be able to take control of Karl and Emile, whose stories overlap one another. 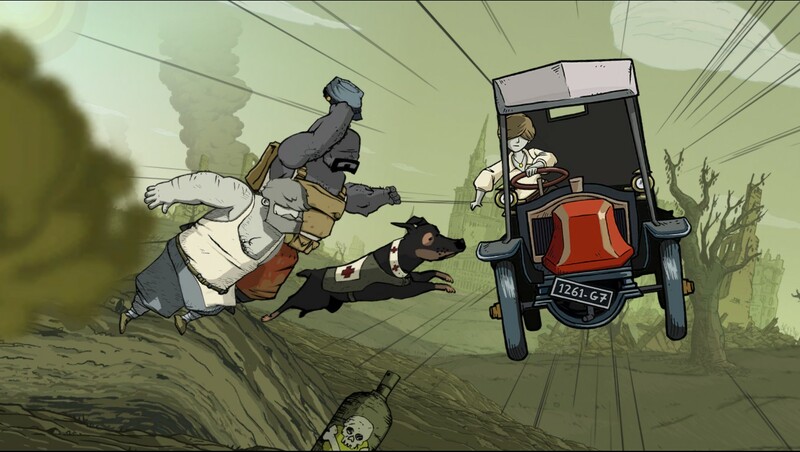 Along the way, both of the men make friends and foes, and the lovable canine companion Walt enters the picture as an essential, playable asset. The story that eventually intertwines between each character that you will meet and play as is one that is equally as exciting as it is depressing, and players will find themselves becoming emotionally attached to them as the horrific events of the war unfold. 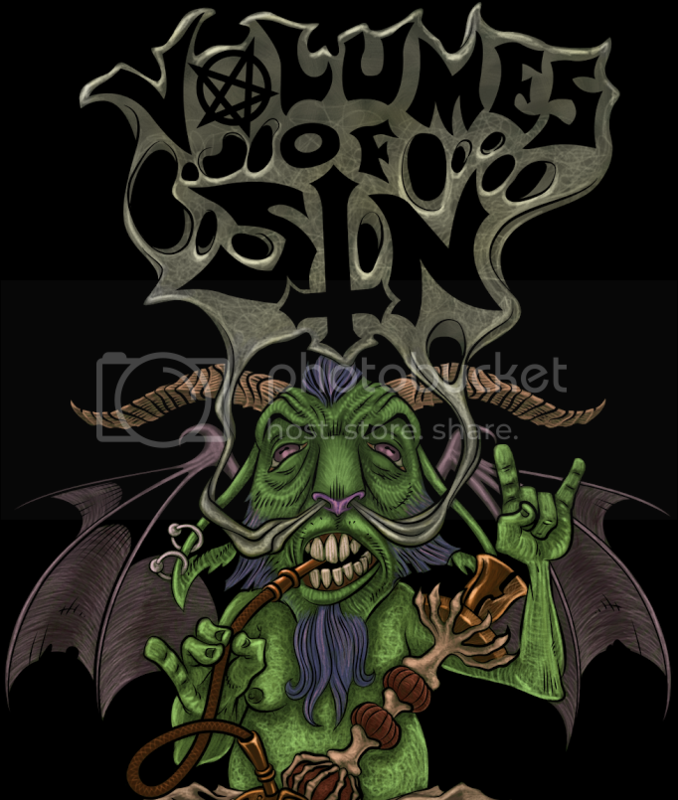 The story itself is told almost completely through a narrator, as the actual characters don't speak much more than gibberish or the occasional muffled word. The fact that Ubisoft were able to develop an emotionally captivating story without the use of character monologue is impressive in itself, as this is a feat that is not easy to achieve. The only true time that the gamer will get a glimpse into the inner thoughts of Emile and crew are through the intermittent diary entries that expose themselves gradually. Valiant Hearts is sectioned into four generous chapters, each made up of smaller sub-levels; a Karl mission here, an Emile level there. Along the way are a variety of historical artifacts to collect, each presenting a fact about the meaning behind them, how they were used and what significance they may hold. There is also a large quantity of historical facts that are present for the gamer to read, if they're so interested in knowing more about World War I. These collectibles give a bit of replayability to the title, which would otherwise lack any reason for a secondary run. The progression of the game is obtained through puzzles, albeit ones that do not present themselves as such but rather rely on a tactical way of thinking. In order to get past guarded areas, the player will need to figure out how to distract soldiers so that they can sneak by or know how to utilize Walt to their full advantage to gain needed items such as wire cutters. The puzzles will leave one with a sense of accomplishment, especially when saving the lives of friends or civilians is thrown into the equation. Although not overly complex, there are occasional boss battles and even driving segments located throughout the title; this, along with the interwoven story line will keep players enthralled until the bitter end. 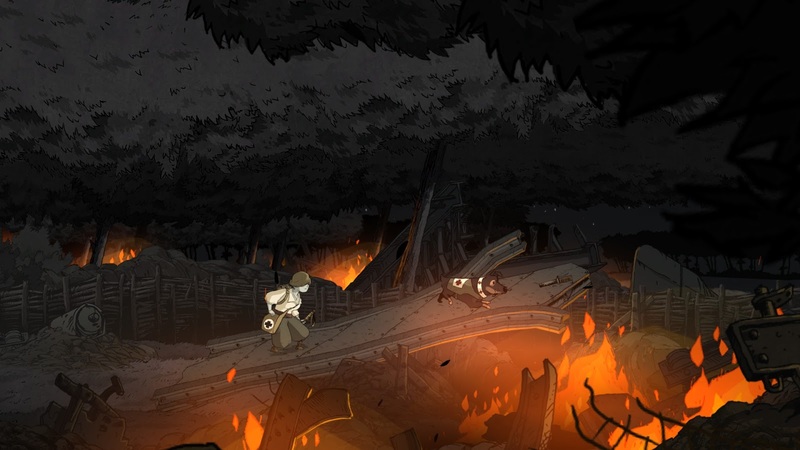 Simplistic and cartoony in nature, the art style is not one that seems to suit such a dark and depressing time in history such as World War I, however Ubisoft are able to make this style work in their favor. The characters are uncomplicated in appearance, to the point that they don't even have eyes, while the backgrounds and foregrounds are richly detailed; the environments change with every sub-level, ranging from gas embellished trenches to mines, towns, snowy forts, forests and much more. Where the artistic levels capture the amazement of the audience with grand ease, the same cannot be said for the soundtrack; which is slightly lacking in some areas, although the players will be too busy focusing on the Sim-speak of the toons and sound effects to care much. Valiant Hearts - The Great War is a richly captivating experience that brings the horrors, victories and heartaches from World War I into a tangible and emotional reality. 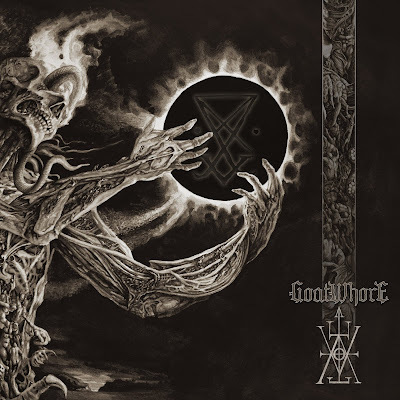 Bombs explode all around, you will witness the men in front of you die by bombs or gunfire, you will be gassed, chased, imprisoned and forced to fight against your own kin. The gameplay progression is fairly smooth, and few puzzles will present themselves as taxing obstacles while the story will keep one pushing forward to know what explosion awaits around the next corner. If collecting historical items, reading facts and diary entries as they are presented, the game should last between seven to nine hours. A definitive purchase, even at the current asking rate, don't let this small gem pass you by.